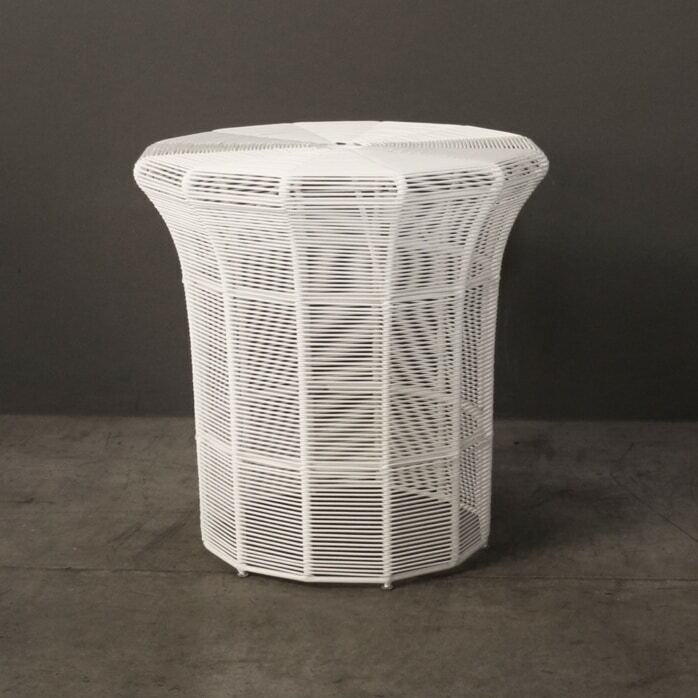 Armed with style, the Poppi Tall Wicker Side Table in charming White is a lesson in subtle sophistication. A core part of the Poppi Collection, the Poppi Tall Table matches its family, with a beautiful woven presence magnified by a flat, round table top and elegant curved base. Whether poolside, against deep seating, by a relaxing chair or in the home as a lamp table or accenting a piece of art, the Poppi Tall Side Table is an excellent piece for many different areas! Situate your gorgeous Poppi Tall Table next to the Club Chair of your deep seating collection, for an wonderful addition of personality as you sink into an afternoon of reading with a cool drink in the outdoors. Imagine your sun room, complete with a charming Loveseat such as the St Tropez… you want to sit back and relax in the warmth and security of this little haven. Adding a couple of Poppi White Tall Tables on either side will give you the comfort and flexibility to truly enjoy your downtime. The Poppi Tall Side Table in White is also available in Black, and in two other sizes! A Low version and a Coffee Table are also in this fantastic collection, so you can curate your space to have a cohesive and elegant style. The Poppi Collection is built on a foundation of strength, a powder coated aluminium frame is then wrapped with the best woven wicker around! Design Warehouse is at the front of all things outdoor furniture related! Peruse our website or call in and see us today for a extensive look at incredible products – from Deep Lounge Seating to Umbrellas, Dining Furniture to Accessories! What are you waiting for? Pick up your Poppi Tall Side Table today!